Economic growth has extraordinarily increased the availability of market goods to satisfy people’s need for comfort, but at the same time it has also raised great challenges to their working, family, and personal lives. Will people learn the skill necessary to cope with these challenges and take full enjoyment from economic growth? The book of Maurizio Pugno explores this question starting from the insights of Tibor Scitovsky (Budapest 1910 – Stanford 2002), and approaching a theory of ‘human welfare’. Along this research line, Amartya Sen’s idea on the centrality of human capacities is developed by modifying the traditional approach of the economic choice. The empirical basis is mainly provided by the recent studies in Economics of Happiness, but also in Behavioural Economics, as well as in the very recent studies of Economics of Human Capital. The most original aspect, however, may be the integration with important concepts of psychology, like motivation, realization of inner potential, and secure social attachment. The book provides, at the same time, a theory on ‘human welfare’, a discussion on how it was conceived by Scitovsky and other economists before him, an account of Economics of Happiness from this perspective, and an application to people’s experience of living in competitive market economies. The unifying concept of the book is learning as an enjoyable and challenging activity. This may enable people to develop the typical human skill, being both social and creative, of setting and pursue the goals that are adequate for their natural dispositions. However, the economic and social conditions are not always favourable to the development of such ‘human welfare’. This may explain why happiness may not improve despite the economic growth. The book is not only the first and only monograph on Scitovsky. It is also an original proposal of a micro-macro framework that researchers and general readers can use to interpret current trends of happiness, to devise new policies for human development, and to understand people’s personal lives. ‘This is a most welcome contribution. 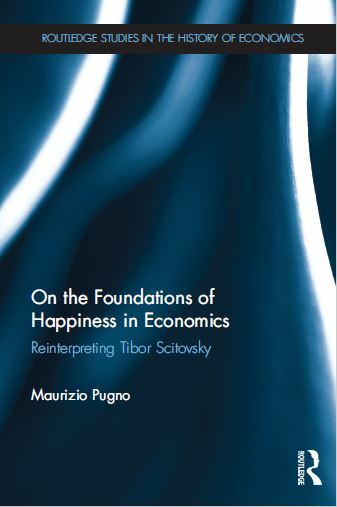 Maurizio Pugno makes a valuable effort to introduce and reinterpret the insight by Tibor Scitovsky into Modern Happiness Economics. These insights have wrongly, and to a large extent, been disregarded in the literature. Pugno discusses e.g. the importance of intrinsic motivation and creativity for happiness, opening up a challenging and fruitful direction of research.’ — Bruno S. Frey Permanent Visiting Professor, University of Basel, Switzerland. ‘Scitovsky’s pioneering contributions on the relationship between economic growth and human wellbeing have so far not received from modern behavioural and happiness economists the attention they deserve. This should change as a result of Maurizio Pugno’s labour of love that has resulted in this most useful volume that sets Scitosvky’s work in context and presents it in today’s more technical style’ — Peter Earl, University of Queensland, Australia and co-editor of the Journal of Economic Psychology 2000-2003.